Discover How to Cook--with Your Senses, Your Hands, and Your Heart "Making your love manifest, transforming your spirit, good heart, and able hands into food is a great undertaking," writes renowned chef and Zen priest Edward Espe Brown, "one that will nourish you in the doing, in the offering, and in the eating." 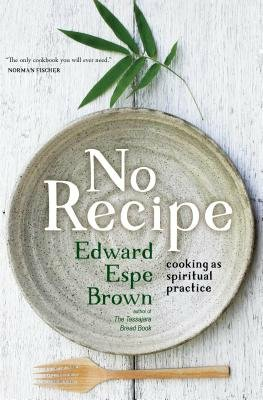 With No Recipe: Cooking as Spiritual Practice, Brown beautifully blends expert cooking advice with thoughtful reflections on meaning, joy, and life itself. Reading Brown's witty and engaging collection of essays is like learning to cook--and meditate--with your own personal chef and Zen teacher. Drawing from a lifetime of experience, he invites us into his home and kitchen to explore how cooking and eating can be paths to awakening. Baking, cutting, chopping, and tasting are not seen as rigid techniques, but as opportunities to find joy and satisfaction in the present moment. "Forget the rules and forget what you've been told," teaches Brown. "Discover for yourself by tasting, testing, experimenting, and experiencing." From soil to seed and preparation to plate, No Recipe brings us a collection of timeless teachings on awakening in the sacred space of the kitchen.